Thousands of bees are making a comeback to London's Kew Gardens as part of a new campaign. Around 20,000 honeybees will be released into two hives in a meadow at the botanical gardens in west London. Bees at Kew Gardens died the same time as many colonies in the UK - possibly due to disease and climate change. The bees are being released as part of a campaign to encourage people to grow more bee-friendly flowers in their gardens. The number of honeybees has fallen by 10% to 15% in the past two years, according to ministers. 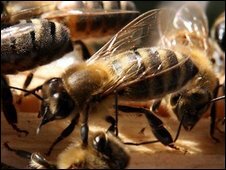 However, a survey of British Beekeepers' Association members suggests losses could have been as high as 30% between November 2007 and March 2008. Annette Dalton, horticultural manager at Kew Gardens, said: "We want to do our bit to help the British honeybee and we hope this will show visitors to the gardens the important interaction between plants and insects." Around 5,000 packs of seeds - equivalent to around 35 million wildflowers - will also be handed out free as part of the initiative. Jordans Cereals, which has a nature-friendly farming scheme, is calling on the Highways Agency and local councils to make publicly-owned land more bee-friendly and plans to teach children about the value of bees through exhibitions. The campaign is supported by conservation groups, leading bee experts, and London's mayor Boris Johnson.